Patricroft Bridge Winding Hole is a minor waterways place minor waterways place place on the waterways major waterways place village town city on the Bridgewater Canal (Stretford and Leigh Branch) between Barton Swing Aqueduct (Manchester Ship Canal crossing) (3½ furlongs to the southeast) and Quayside Winding Hole (8 miles and 1 furlong to the west). 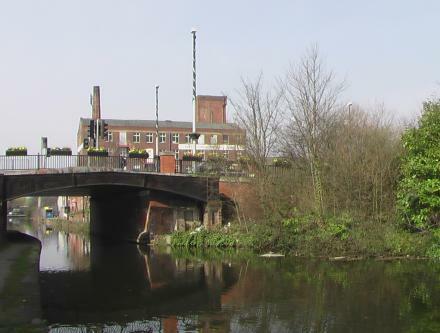 The nearest place in the direction of Barton Swing Aqueduct is Patricroft Basin and Warehouse; 1¼ furlongs away. The nearest place in the direction of Quayside Winding Hole is Patricroft Bridge No 47; ¼ furlongs away. 303 Liverpool Road, Manchester, M30 0QN — 183 yards to the northeast. Liverpool road, Eccles, M30 7BU — 151 yards to the west. 18-20 Trafford Boulevard, Manchester, M41 7 — 1416 yards to the southeast. 41 Monton Green, Eccles, M30 9LL — 1569 yards to the north. Trafford Way, Manchester, M17 8DD — 1423 yards to the south. 204-206 Monton Road, Eccles, Manchester, M30 9LJ — 1451 yards to the north. 168 Monton Road, Manchester, M30 9GA — 1411 yards to the northeast. Manchester — 209 yards to the north. Eccles — 1265 yards to the east. Trafford Quays Leisure Village, M41 7JA — 1603 yards to the south. Manchester, M17 8DD — 1352 yards to the south. 2 City Approach, Albert Street, Eccles, Manchester, M30 0BL — 1587 yards to the east. 193 Monton Road, Monton, Eccles, Manchester, M309PN — 1378 yards to the northeast. 6th Floor, 2 City Approach, Albert Street, Manchester, M30 0BL — 1597 yards to the east. Manchester — 1372 yards to the east. Monton Unitarian Church, Monton Green, Monton, Eccles, Manchester, M30 8AP — 1482 yards to the north. 327 Liverpool Road, Patricroft, Manchester, M30 8GF — 116 yards to the west. Monton Eccles, Manchester, M30 — 1360 yards to the northeast. Green Lane, Manchester, M30 0GX — 585 yards to the north. Barton upon Irwell — 740 yards to the northeast. Manchester — 803 yards to the southeast. Manchester — 806 yards to the southeast. 174 Monton Road, Manchester, M309GA — 1416 yards to the northeast. Trafford Way, Trafford Park, M41 7 — 1511 yards to the south. albert street, Bolton, BL67AP — 1587 yards to the east. Monton, Manchester, M30 — 1360 yards to the northeast. Manchester — 1511 yards to the northeast. Manchester — 1293 yards to the east. Manchester — 1561 yards to the east. Sentinel House, Albert Street, Eccles, Manchester, M30 0SS — 1539 yards to the east. legh street, Manchester, M300UT — 127 yards to the northwest. 7, Trafford Way, Trafford Quays Leisure Village, Manchester, M41 7JA — 1433 yards to the south. Old Park Lane, Manchester, M17 8PG — 1528 yards to the south. Furrow Drive, Salford, M308FD — 1487 yards to the north. Manchester, M30 9L — 1342 yards to the northeast. Manchester — 963 yards to the east. Manchester, M17 8DD — 1485 yards to the south. Barton Lane, Manchester, M30 0 — 1457 yards to the east. Bridgwater Mill, Legh Street, Eccles, M30 0UT — 163 yards to the north. The Trafford Centre, Manchester, M17 8 — 1602 yards to the south. 1420 yards to the southeast.